African American students are more than three times as likely to be handed out-of-school suspensions as are white children, according to an extensive study released Tuesday by education researchers affiliated with UCLA. Nationwide, one out of six African American students is at risk of suspension every year, compared with one in 14 Hispanic students and one in 20 white students. “Opportunities Suspended: The Disparate Impact of Disciplinary Exclusion from School” is the latest report to highlight racial and ethnic disparities in student discipline and to call for alternatives to out-of-school suspensions. It includes a database of suspensions by race and ethnicity for districts and states. Instead of addressing the underlying issues, out-of-school suspension leads to further disaffection and may contribute to the higher dropout rates among students with a disciplinary record. The report does not allege widespread discrimination; however, it says the data “should cast heavy doubt on assumptions that different suspension rates between groups merely reflect differences in behavior.” The report cites research in North Carolina that found that African American students were more likely than others to be suspended for first-time infractions including cell phone use, dress code infractions, disruptive behavior, and public displays of affection. A number of bills before the Legislature would mandate or encourage districts to reduce suspensions or limit their length for “willful defiance” violations – discretionary, non-mandatory suspensions. In addition, recommendations for changes in policies for expulsion and suspension are expected to be a key component in the report of the Assembly Select Committee on the Status of Boys and Men of Color, chaired by Assemblymember Sandré Swanson of Oakland, which will be released tomorrow preceding a hearing in Sacramento. Using data released earlier this year by the federal Department of Education, researchers Daniel Losen and Jonathan Gillespie analyzed suspensions at 6,779 districts covering 85 percent of the nation’s K-12 students in 2009-10. They found large differences among states and among districts in student suspensions. California’s 17.7 percent suspension rate of African American students was 0.6 percent higher than the national average; Illinois was highest at 25 percent, while the rates in Maryland and Arkansas, with significant minority populations, were 11 percent. California ranked 20th in the nation in terms of the gap between African American student suspensions (17.7 percent) and white suspensions (5.6 percent) – a difference of 12.2 percentage points. Illinois again ranked highest with a 21.3 percentage point gap. However, California ranked 6th in the nation in suspensions of black students with disabilities (27.8 percent in 2009-10), the subgroup of students with the greatest discipline problem. A half-dozen California districts had the dubious distinction of being among the top 10 suspenders of students by race and ethnicity, although they probably warrant asterisks. Most are small districts that suspend unacceptably high rates of all students. Source: “Opportunities Suspended: The Disparate Impact of Disciplinary Exclusion from School,” by Daniel Losen and Jonathan Gillespie. Ravenswood City Elementary District’s 18.8 percent suspension rate of Asian Americans (primarily Pacific Islanders), who constitute 10 percent of the 3,403 students, was the highest in the nation. The district in San Mateo County also suspended 40 percent of its African American students and 12 percent of its Hispanics. Morongo Unified (9,090 students in San Bernardino County) ranked third, suspending 16.4 percent of Asian American students, about the same proportion of white and Hispanic students in the district, while Visalia Unified, which suspended a quarter of its 27,688 students at least once in 2009-10, according to the report, ranked fifth, suspending 15.7 percent of Asian Americans. Visalia, in Tulare County, was also third in the nation in suspensions of Native Americans: one in three. Burton Elementary District (4,083 students) in Tulare County* and Victor Valley Union High School District (15,186 students), in San Bernardino County, ranked 9th and 10th respectively, with 11.8 percent and 11.1 percent of Asian American students suspended. But both districts suspend 20 percent of students overall, and Burton also suspends an unusually high percentage of white students (22.4 percent of 1,126 white students); Victor Valley suspended 39 percent of black students; Asian American students comprise less than 2 percent of its students. 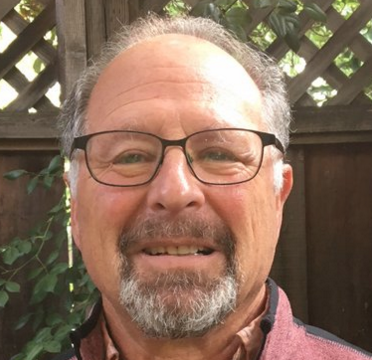 Jefferson Union High School District in San Mateo County (4,969 students) ranked 4th nationally in suspending a whopping 60.5 percent of its 167 African American students (only 3 percent of the total student body). It also suspended 20 percent of all students, three times the national average. No California district was in the top 10 for suspension of Hispanic students, but Konocti Unified, in Lake County, and Brawley Elementary District, in Imperial County, were 9th and 10th for white student suspensions with 28.9 percent and 27.7 percent respectively. The rate for whites in Brawley (3,725 students) was three times the 9.1 percent for African Americans and more than quadruple the 6.4 percentage for Hispanics. Whites compromise the majority of students in Konocti, where one out of four students was suspended in 2009-10. As for alternatives, the report cited the dramatic shift in Baltimore City public schools, where out-of-school suspensions fell by more than 50 percent under policies set in place by Superintendent Andres Alonso. Among the strategies recommended by the report: after-school detention, Saturday school, parent conferences, in-school suspension, and alternative programs such as restorative justice, in which the students face the victims of disruptive behavior. The report also suggests more training in classroom management for middle and high school teachers. “We do know how to educate children successfully without relying on the ineffective, harmful practice of suspending the very students who often have the most to gain from staying in school,” the report says. Summaries and updates of bills currently before the Legislature on suspension and discipline. “Opportunities Suspended: The Disparate Impact of Disciplinary Exclusion from School,” a report by the Center for Civil Rights Remedies at the Civil Rights Project at UCLA. What the heck is the rationale for suspending ANY student for first-time cell phone use? Seems to me a much more effective answer would be to confiscate the phone and hold it until a parent comes to pick it up. The statistics show high rates of suspension for minority students and especially for minority students with disabilities, but “the data do not contain information on the reasons for suspensions or the extent to which similar students were treated differently”. Flimsy analysis is used for that, with references to press releases and personal e-mail messages. Problem: This approach would show the composition of the pool of suspended students. We would have to weight the figures according to the racial composition of the student body. Even so, we could not know the underlying rates of misbehavior. Problem: This approach would be better, but would still be biased because cell phone violations not resulting in a suspension are much less likely to be tracked. Cases in which teachers choose to turn a blind eye are, by definition, not tracked. Referral slips might not be processed, let alone entered. Since the underlying source is a personal e-mail, we know nothing about the accuracy of the data. Without regard to their race, let alone to the skill level of their teachers, individual students who misbehave more often are suspended more often. That is as it should be. If we want to maintain any sort of constituency for the public schools, we have to move anti-social elements out. Cell phone use, rude remarks, sexual touching, and so on — cavalierly dismissed by the authors as “minor offenses” — set the tone in the classroom. Teachers, would you want to teach in a school where “conferencing circles”, “ecological management” and “empathetic responses” [pp. 44-45] were the only disciplinary responses left available to principals? Parents, would you want to send your children there? Taxpayers, would you want to fund such a circus? Connection to their school? It is the parent’s AND the student that have to be responsible! There has to be a social ‘norm’ of behavior that is commonly accepted within a society. When you violate this norm, you are responsible (or if you’re a juvenile) your parents are responsible for your behavior and actions! You rob a liquor store, you go to jail. You disrupt a class and are defiant, you get kicked out, period! That’s because that particular ‘group’ has a proven track record of such behavior. What about the other student’s right to an education without disruption or distraction? Or are we so stuck on some kind of stupid ‘justice’ cause that we totally ignore common sense and place the blame on the ‘system’. Just watch the weekly ‘flash mob’ video on any news outlet and my point is proven. “Victor Valley suspended 39 percent of black students; Asian American students comprise less than 2 percent of its students.” Well, doesn’t that say it all! I believe the ACLU and an army of lawyers should sue the pants off the Victor Valley (and I’ve lived there, btw) School District, because White kids are being suspended at a far higher rate than Asian kids! Where’s the justice in that? I’m guessing we’re stuck on stupid and the best course of action is to lower the bar, not only for grades, but for behavior too. And let’s do more studies and better yet, let’s throw government money (no wait, Taxpayer Money) at a problem that will never get solved until that particular demographic figures it out, but that will be a long wait as well. 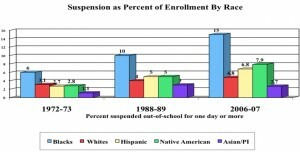 I need a clarification: Are African-American students more likely to be suspended for the SAME offense as while students?